Read the first part of Khaleesi’s story – from street to safety. Little did we know when we found Khaleesi on Monday last week that her rescue would sound a chord in so many people. Her story has gone around the world – from Hawaii to Australia and so many places in between. We are incredibly grateful for the support and good wishes sent from far and wide. Khaleesi is still facing some challenges in returning to full health, but we will continue to do our very best for her and not give up on her. Some people were concerned to see the pictures of her in a cage. We would like to reassure you that we only put her in the crate for her safety when we were transporting her back to Rudozem. As you will see below, she soon took up residence in our house because the shelter itself is full with the 120 other dogs and cats we have rescued from the streets of Rudozem. Click here to see Khaleesi arriving in Rudozem. “On Tuesday morning, we found Khaleesi curled up on the blanket, still fast asleep in the kitchen where we had left her the previous night. She had, after all, had a great deal of excitement and stress the previous day. As soon as she heard our voices, she looked up, wagging her tail and leaning into me as I stroked her head. It still amazes me how even the most abused and neglected animal can still find it in their hearts to trust again. Click here to see a clip of Khaleesi waking up. “After breakfast, Khaleesi wolfed down a painkiller and worming tablet – it’s a good sign that she still has an appetite. She wandered between us, being curious and wasn’t even phased by the annoyed barking of Frodo, another dog we rescued from the side of the road (but that’s another story). He’s used to getting a lot of attention! Once the medication had time to work, I gave her a good rub-down. The mange has caused her skin to thicken and crack and it is important to soften it up and remove as much as possible so that the treatment will have the best chance of penetrating to the living skin underneath. We also set about removing the ticks from her – some had even made their way into her ears which must have caused her great discomfort. We then just gave her the space to get used to her new surroundings. Click here for a clip of Khaleesi’s rub-down. “On Wednesday, Khaleesi had another shower. The softening cream I have been rubbing into her is also working a treat because the dead skin is coming off nicely (if you can say that about dead skin!) She is so very patient. At last, we are starting to see some fur which had been covered up by the scabs and lesions. Here’s a clip of her showing off her tufts. “This little dog has surprised us already in so many ways so imagine my amazement when I walked into the kitchen to find that she had sat herself at the table and looked to be waiting for dinner! No, really. Where’s my dinner? “On Saturday, we drove to ProVet in Plovdiv to get Khaleesi fully checked out. It’s a 125 kilometre away and in Bulgaria going that far can take up to three and a half hours. We let Khaleesi wander around the garden before we left and then lifted her back in the crate for the ride. After a 3-hour journey, we finally arrived at ProVet where the staff took such good care of our girl. It took 5 hours for them to examine her, remove more ticks from inside her ears, carry out two sets of blood tests and skin scrapes, and bandage her leg. The vets agree that she is about two years old, maybe younger. The priority now is to get the sarcoptic mange under control so the vet strapped Khaleesi’s leg to limit her using it too much. It may be misshapen as a result of poor nutrition when she was growing. “Khaleesi has had an injection and we will have to give her another one next Saturday. In two weeks’ time, we will take her back to ProVet when they will do more skin scrapes to test her reaction to the mange treatment and more blood tests to assess her response to the ehrlichiosis treatment. She may also at that point be ready to have her legs x-rayed. She has different antibiotics and two other lots of tablets. Ehrlichiosis can be a very serious disease and how Khaleesi responds to treatment will depend entirely on how long she has had it. In its early stages, ehrlichiosis can be treated, but it may have caused secondary problems that we don’t yet know about. What does the future hold for Khaleesi? “People have already completed pre-adoption forms for Khaleesi and it is comforting to know that there are people out there ready and willing to give her a loving home. Right now, we can’t bear the thought of her ever going anywhere because we feel so protective over her. Some dogs we rescue aren’t suitable for adoption because they have fear/trust issues and may be too nervous or aggressive – these dogs then stay with us. But, hopefully, the day will come when Khaleesi is fit and well and we know that, if there is the perfect family for her, we will have to let her go. 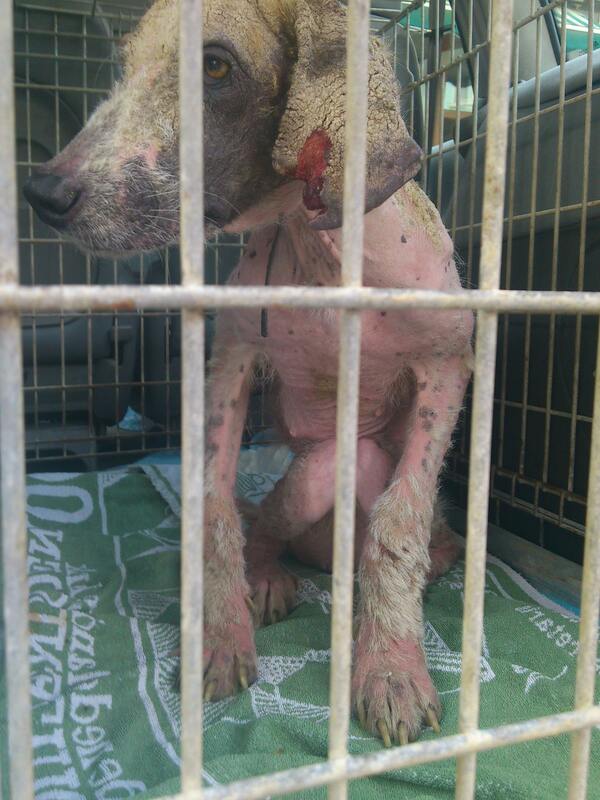 It will be so hard, but we will have to do it so that we can carry on helping more dogs. If you would like to donate towards the costs of Khaleesi’s care, please click here. THANK YOU for all that do for ALL of the animals. She is so sweet and lovable I can imagine it would be very hard to let her go.For now she is where she needs to be and this is all in the Rescue and the Lord’s hands.We are praying. Everyone loves her! Aww, you can beat this Khaleesi, you are a fighter, and I believe in you. Hi Dear Tony Rowles! Excuse me can You tell me what is the breed/kind of KHALEESI? I have the same dog a boy- Sharco is him name. Thank You!!! Khaleesi is 100% street dog! 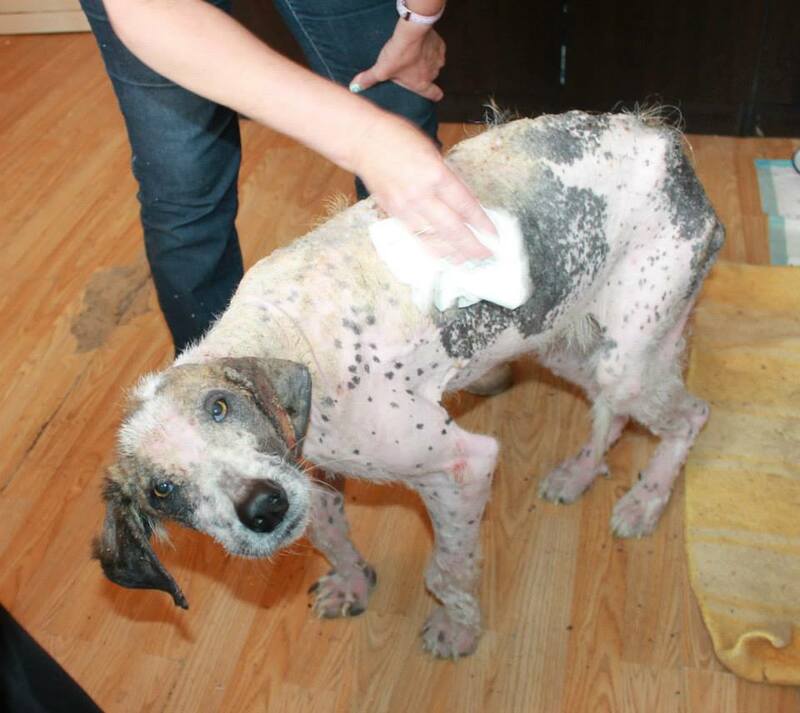 Thank you for posting about this pup’s rescue and recover efforts. And for all your efforts. How is Khalessi and where it she today? Thanks for your kind words, Nancy. Khaleesi is really well and very happy as she lives in Tony and Diane’s house in Rudozem, Bulgaria. She is still waiting for her forever home. You will find out more about her on our Facebook page and our website streetdogrescue.com. Hi Nancy, she’s doing really well. She’s happy at the shelter with her best buddy Ragnar, but we would still love it if one day she could find her forever home. Thank you for caring. I came across this site on my Facebook and was so touch by all your stories and everything you do, I cried so much for Khaleesi story because of the love and the will that she finally found and fought to live. My tears were tears of joy especially on how much you all do for these beautiful pets! Thank you for doing this and blessings! I just came across Khaleesi on the dailymail website today and was so shocked and upset that there are dogs in this much distress. I would’ve taken her home with me if I had seen her. I have today donated a little to help with her or any of the other souls. I noticed that you are listed on Ebay as well to raise money for them all. No words can express the beauty of what you do there — and Khaleesi’s story seems to be the epitome of wretchedness and recovery. What a dear, dear dog and rescuers. . .I am contributing everything I can to politics now, but may be able to help later. In the meantime, I wonder if Khaleesi was able to recover completely from canine ehrlichiosis and mange. She looks happy and confident. And very well!! what you guys do for the animals is the most amazing thing i have ever hard of the first picture of khaleesi i seen made me cry and as i seen more pictures of her recovery i felt so happy for her and just wanted you to know that i think what your doing is amazing. Khaleesi has been through hell and is certainly a fighter. She is a beautiful dog and God Bless You for going and getting her and giving her all the treatment and love that is giving her the will to fight for her life and a new home. Please keep me up to date on her progress. I live in the U.S. and I hope since you have received a log of letters wanting to adopt her, I ‘m sure when she is well enough, she will find a new loving home. I know I would hate to say goodbye to her if I was taking care of her. And, that she gives you loving kisses shows she knows you have saved her. I have a pet but hope to retire in the future and relocate. Please keep me up to date on her. If no one adopts her and I am in a position to take her I would love to but would need to see what costs were involved to ship her to me in the U.S/ Gpd Bless You and please give Khalessi a hug and kiss for me. She is such a beautiful dog. You can tell it. That someone would dump her and leave her to face the future in this manner is unforgiving. WE have bad people here as well that mistreat these beautiful gifts that God has given us and I wish them all “hell” on earth for what they do to these “Gifts of God”. Looking forward to her updates. What a wonderful dog. The spirit of this amazing creature just amazes me. Thank you so much for taking care of this poor animal. She needed desperate help. And you provided much more than that. You gave her hope and love. And you gave her a life- Thank you. I know there are people like you out there. Thank you for proving that! Seeing Khaleesi in those photos was so hard, but watching her transformation is simply indescribable. The world is full of such terrible news. Seeing Khaleesi’s recovery restored my faith in manking. Thank you for all that you do. She’s a beautiful dog with a beautiful soul. We continue to hope that she will find her forever home one day. The best of humanity, inspiring and amazing people, thankyou so much for helping these poor animals. Am in total awe ! It is amazing what miracles loving kindness and an ability to see beyond the surface can do. The capacity of dogs to forgive and love is another miracle. Thank you for being there when she needed you. I never cry. Not even from watching dramatic movies. But this dog’s triumphant return and after seeing her last photo made me used up all of our tissues and now going for the paper towels.